Mine's not as awesome as hers, having no hand-stitching or much couching. It's a sample for a class on using decorative stitches that I'm teaching in Lynchburg this Saturday with a fun group of gals. I had read online about folks loving Burda Style magazine and of course there's a lot of buzz about the Generation Q Magazine , so I got that too. Loved them! I really appreciated that there were even a few patterns in the Burda magazine that would fit my huggable self. The other magazines were good, but not total love. Got a book on sergers too, since I'm learning to use them. Some great projects in it. 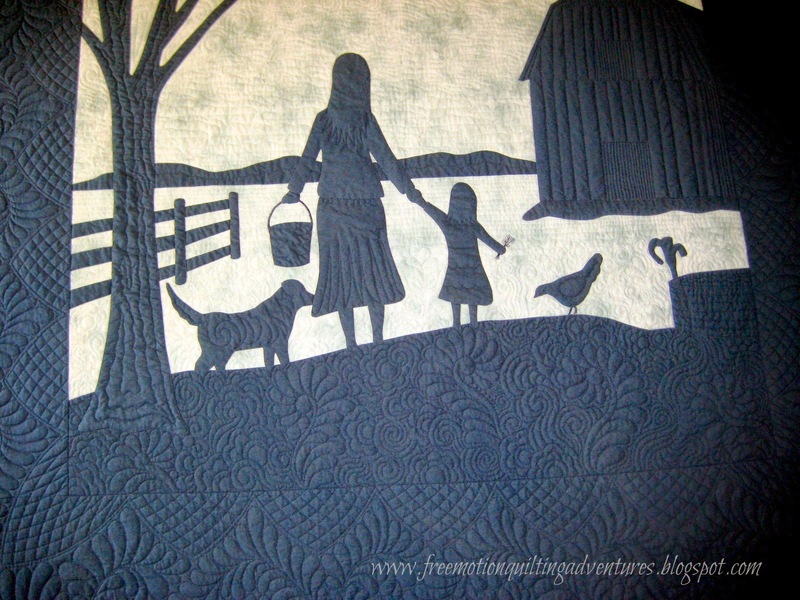 Tomorrow, I am taking the farm quilt to meet it's new owner (and farmer girl). I loved working on it, but I am glad to be done with it and getting it to it's new home. It's the last post of my ruler work series! I love ruler work when free motion quilting- the contrast between lines and curvier free motion designs like swirls or feathers is just fabulous. It's safe to say that posts here will continue to feature the technique. I hope you've learned from this month's series and will continue to use ruler work in your quilts. I started a new customer quilt this weekend and am using continuous curves on the center panel of hexies. Continuous curves this small are a bit fiddly and can also be done without a ruler, but the result isn't usually as uniform as with a ruler. Freehand continuous curves can be treated much like a grid-based design and that is the focus of next month's Monday series. This seems like a good transition, don't you think? As I say in the video, I'm not too thrilled with this ruler set I used. I had recently bought them (nested ovals) but I could have sworn I had ordered nested circles. I don't like the nested idea. I think I'd rather have separate circles. You have to tape the nested ones together to have enough to grasp with your hand. To top it all off, the edges were very rough, in some places they were downright sharp and snaggy. It pays to get quality rulers. Trying out my rulers for the right size. But I needed something smaller than the smallest semicircle I had in my set from Accents in Design. A one or one and a half inch circle would have been ideal. That's about all I have for this week, except to announce our winner of the Continuous Curve ruler set from Accents in Design! 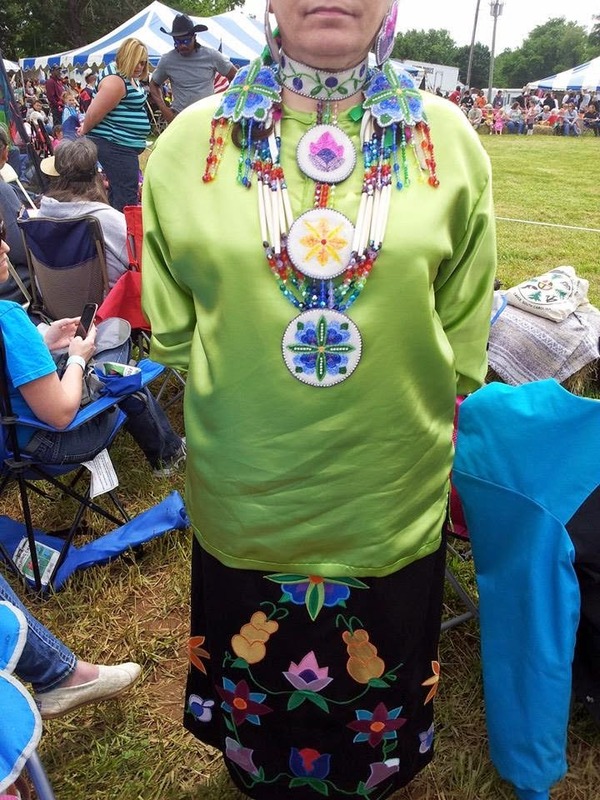 Jasmine, who blogs over at Quilt Kisses is our lucky winner! I'll be sending her information in to Carol this week to get her rulers on their way. Next month there will be a new giveaway as we work on grid-based designs together. This is the last week to link up for ruler work and I am hoping some more of you have been giving this technique a try. Doesn't need to be fancy, but we want to see what folks are doing with rulers and free motion quilting! Though fancy is good too! If you've missed any of the Free Motion Monday posts, you can find them on the Free Motion Mondays page. For the linky this week, link up a post of ruler work you've done, if any. If you haven't done any, feel free to use a ruler to draw out any line based designs that you'd like to explore. You can use rotary cutting rulers for drawing. If you've written a post about wanting to do these types of designs, you can post that too! Keep your post relevant to this quilt along please. Spammy posts will be deleted. Reciprocate! Link back to this post somewhere in your post. You've got to dance with the one who took you to the party, so make sure you link back. Please make sure you leave me a way to contact you if you are a no-reply commenter, especially if you ask a question. Don't forget to bookmark this blog, follow, or sign it up in your favorite feed reader. Like the facebook page (I do post some short things on it pretty regularly), or even check out my Pinterest boards, which includes one devoted to examples of ruler work. I'll be visiting you too! Today is Memorial Day in the USA; remember the fallen, those who have served and those who are still serving in our armed forces. I'm linking this up with Hexie Weekend as suggested by Angie (A Nudge). 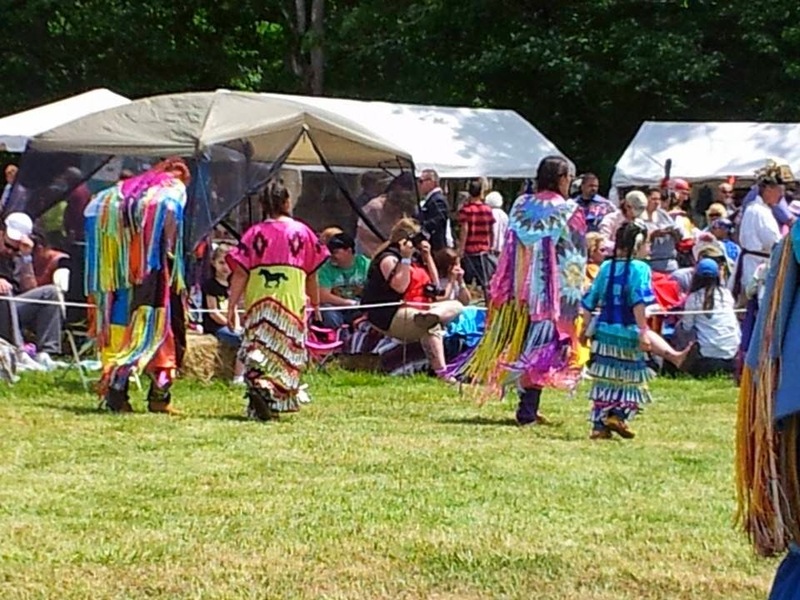 Last Saturday, we headed off to the annual Monacan Indian Pow Wow near Elon, Virginia. 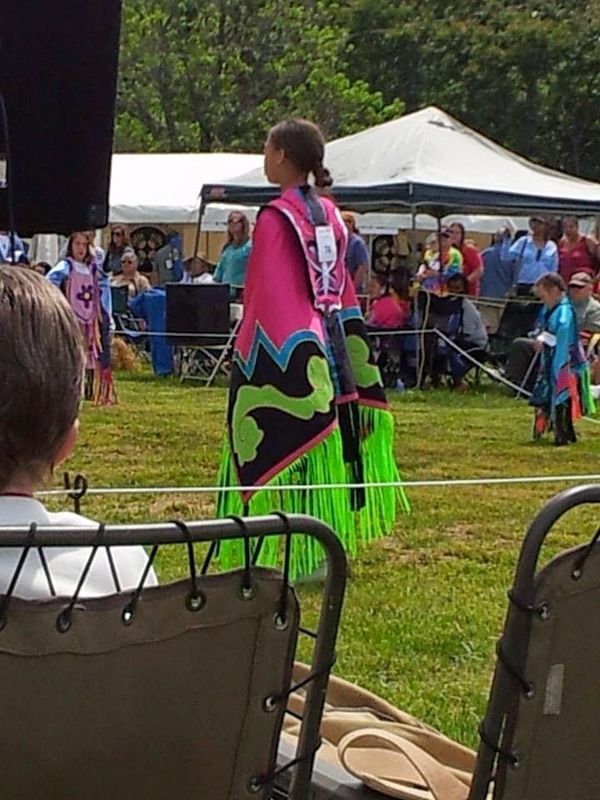 The Monacan Indians are a relatively small group in central Virginia and are working towards being officially recognized by the government. 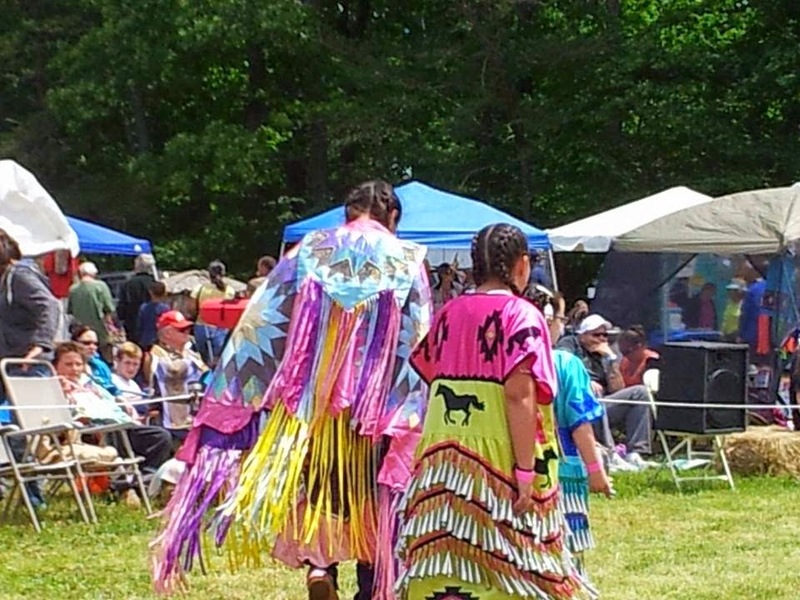 We have friends in the tribe who were there and it was great to watch their daughter dance and to look at all the clothing the dancers wore. 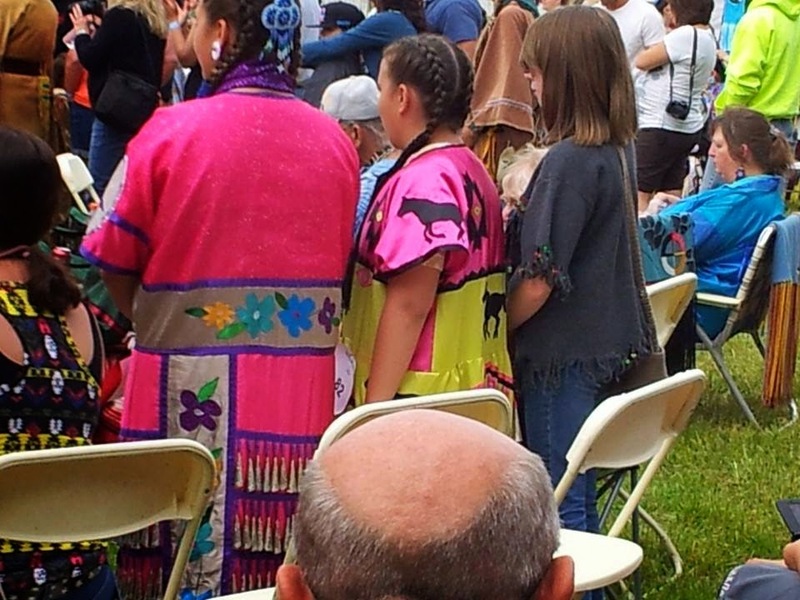 I imagine the man on the left is what most think of when we hear American Indian, but look at the lovely young lady in the middle. The dress of the participants ran a wide gamut from very traditional (referred by the announcer as old-school) with no metal or non-natural items, to very modern-day materials, and everything in-between. The young shirtless man in the black hat and glasses was a very energetic dancer. The men definitely get to have more variety in the dancing than the women, which for the most part was a very demure rhythmic step shuffle. But what caught the eye of this quilter was all the applique! As quilters, we have a tendency to forget that stitching one material to another for decorative purposes is used for a wealth of beautiful items and purposes besides quilts. The above isn't pieced, purely applique. It sure was pretty during the women's Butterfly Dance, which involved much turning with outstretched arms and was the highlight of the ladies' dancing that we saw. 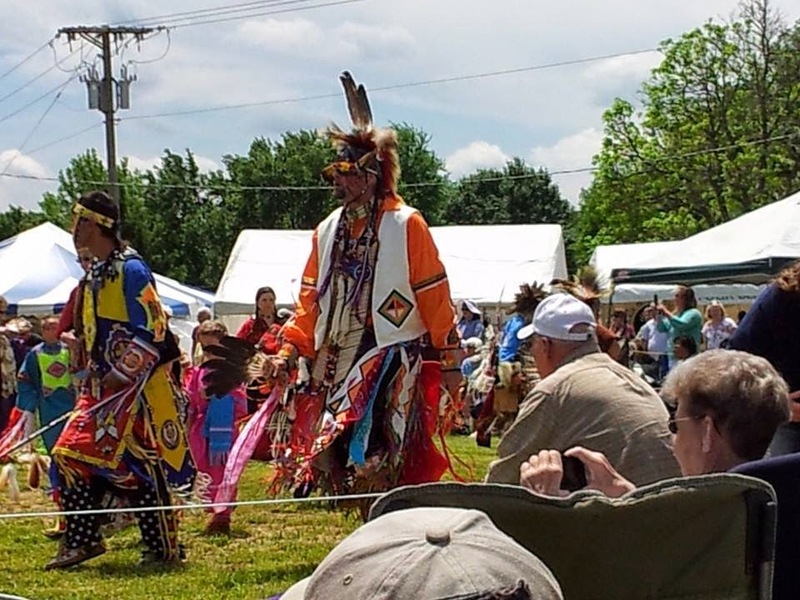 From what the announcer was saying, there were more tribes and people groups present than just the Monacans, encompassing a large portion of the Mid-Atlantic area of the USA. 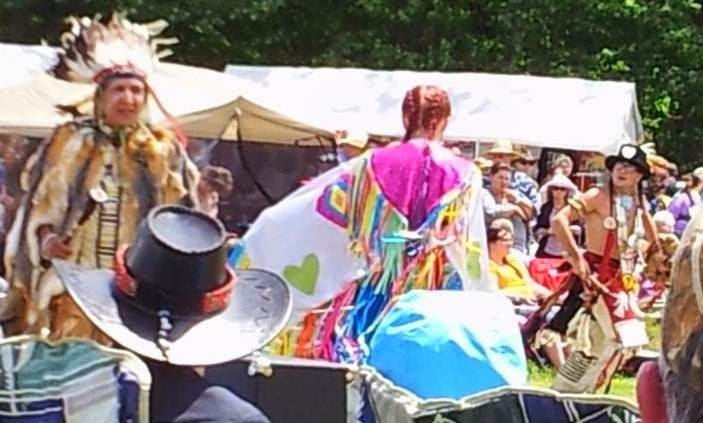 I wanted to get a better shot of this woman's skirt, but she wasn't too pleased with me. So I took this shot and moved on. I had accidentally asked if I could take a picture of her costume. She took offense at the word costume, for which I apologized profusely. I didn't ask what I should call it; traditional dress? Regalia? This girl was absolutely beautiful! Look at those large curvy designs on her cape. Most of the applique on the garments were zig zagged down, sometimes with a contrasting satin stitch. Even the men had traditional designs in applique. There were so many beautiful designs that I just might have to add a Monacan inspired quilt to my list of future projects! I hope you enjoyed these photos! It was a beautiful day for the event too. It has a reputation for being either incredibly hot or raining. Today starts the voting for viewers choice over at the Blogger's Quilt Festival. You can vote for your favorites among several categories. I recognized Karen's quilt among the pieces nominated for Viewer's Choice. 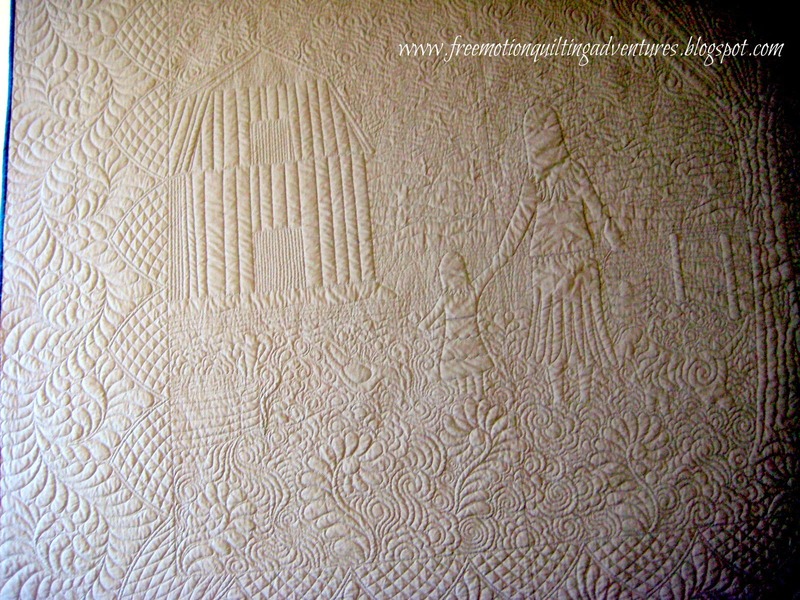 There are so many gorgeous quilts to see and wonderful blogs to visit. 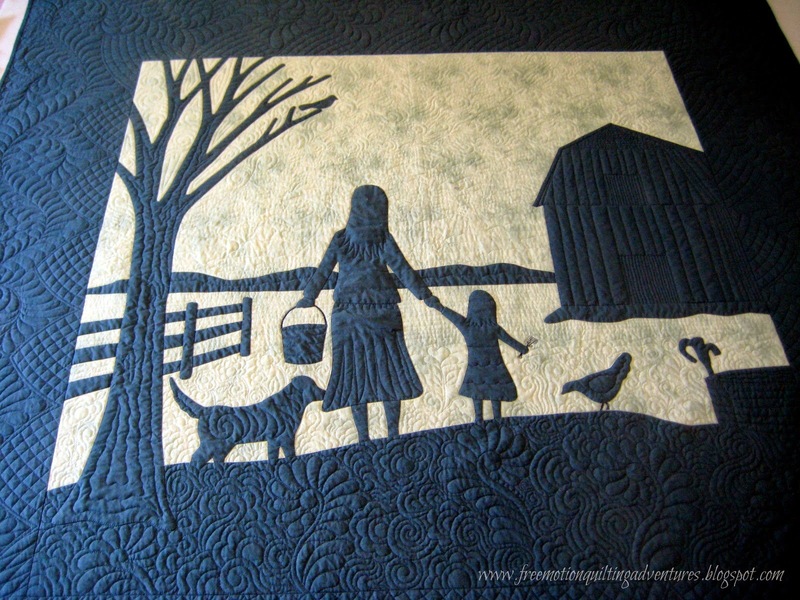 Though not in the running for Viewer's Choice, I have one quilt entered and I know several readers of my blog do too! Finally! The farm quilt is done! Whew, I loved doing it, but it seemed to take forever and life conspired to give me only little bits of time to work on it. Binding done and time for a bath. Special note: If you use Fons and Porter's white mechanical pencil on dark fabric and then the fabric gets darker when wet, the white will get very bright and act like it will never go away......But it does. Don't freak out. Ahem. Time to assemble the foam board so the quilt can dry flat. This 6ft.x8ft. piece takes up nearly the entire room! I have been showing shots of this in progress for a while and have been accused of being a tease with it. It's featured in a few of my free motion quilting videos too. It lays so nice and flat, square. It was a challenge to not over quilt this quilt as it was just so fun to do, but it is destined for a bed and no one wants a stiff quilt on their bed. I don't have a big enough area to get a good square, full view shot of the quilt without moving my entire bed out of my room. (Doesn't everybody have a huge design wall behind their headboard?) So I took the best pics I could while up on the staircase overlooking the table. I am super pleased with how this quilt turned out. My friend wanted "something farm themed but not cutesy". 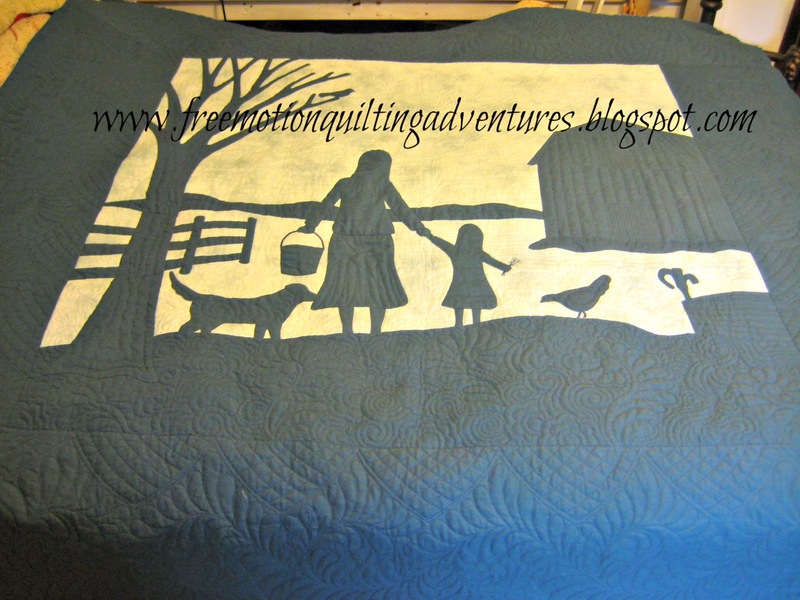 I think I will do another quilt in a similar silhouette style someday, but definitely smaller! My little sparrow. 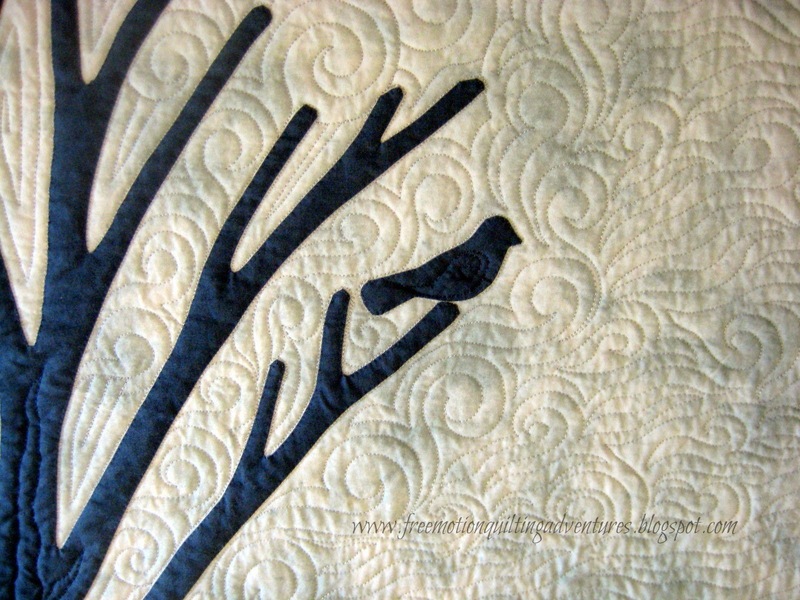 I quilted bigger swirls around the branches of the tree to give a nod to foliage, not just bare branches. Two shots of the back. Finally, a closer shot of the ruler work. I love how this has turned out! I am so happy to have figured out I could use the ruler toe for use with the Janome 1600P in a frame system could be used on my Janome 6600 for regular sit down free motion quilting on my sewing machine. I am thrilled to be able to share the technique here with so many wonderful quilters! If you're new here, click to find more about using long arm rulers for free motion quilting on a domestic machine. My own design, but inspired by some illustrations in some of my kids' early reader books. A commissioned quilt so I don't get to keep it. 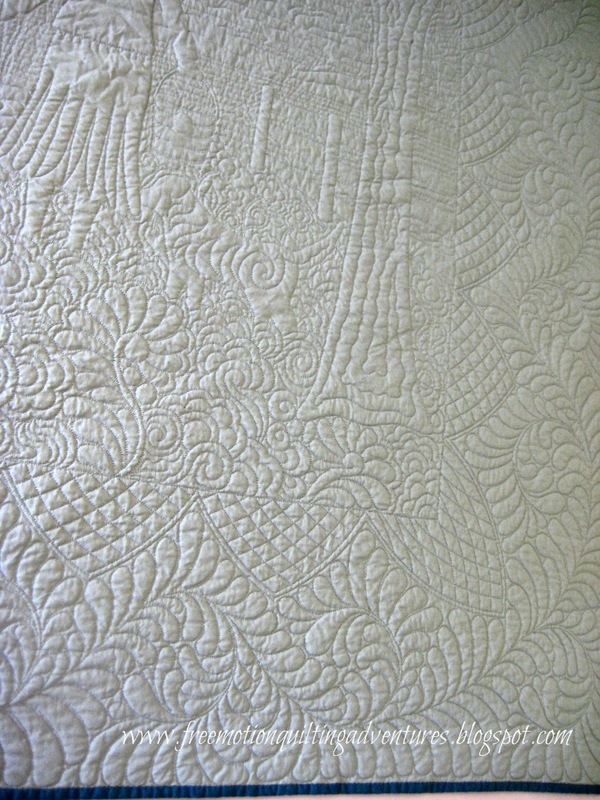 Made and quilted on my Janome 6600. To top it off, it's finished just in the nick of time for the Blogger's Quilt Festival where I'm entering it in the home machine quilted category. Maybe somebody will like it enough to nominate it for a viewer's choice award? Maybe a few votes? Hmmmm...what is the etiquette for these voting things? I dunno. 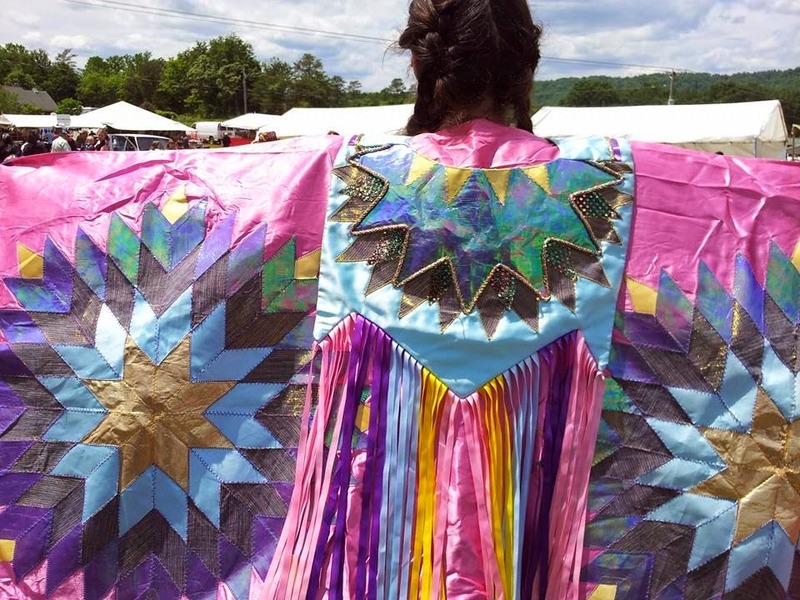 But I do know that if you'd like to see some fabulous quilts, head over to the festival for links to a ton of great quilts and blogs. You might even want to enter one of your own! Plus there's some great giveaways. I thought for week 3 of our Free Motion Monday Quilting Adventure featuring ruler work, I'd focus on a few different designs and show how rulers can be used on pieced areas. I grabbed a sample piece left over from one of my classes to play on and marked off some different lines and shapes. I used a great stencil from www.quiltingstencils.com. One half has lines spaced one inch apart while the other has a radiating set of lines for marking the center, sides, and corners of a square. If you like this stencil, it will be an important part of June's Free Motion Monday series, when we focus on grid based designs and have a giveaway of a few stencils like these! Then I filled in the sides of the design to make the center diamonds pop! I had referred to this design last week. Any dense fill could be used. I made a few registration marks and then dressed up those diamonds! After that, I moved onto a sashiko-type design or pumpkin seed design using a circular shape over these two inch squares. I used the smallest Fine Line half circle. At 3.5 inches, it is perfect for making a 4 inch circle. I started by doing a full circle with the half-circle template, flipping it over for the other side of the circle. But I found this to be unwieldy, as the ruler needed to rotate so much around the foot. Since this is a small sample piece, I could have rotated the piece around more so the ruler wouldn't need to move around the foot so much, but knowing that isn't an option when working on a bigger piece, I didn't do that. Instead, I used the etched cross-hair markings to line up with the lines that created my squares and did the quarter circle arcs across the squares corner to corner, moving from square to square. I think that this design demonstrates that there's definitely a difference between the designs that are better suited to ruler work on a domestic machine and those on a long arm quilting system. With more clearance around the foot and visibility, the sit-down long arms might be able to handle a circular template easier than a sewing machine. For this reason, I will definitely say I don't really recommend a full circle ruler or even the half-ellipse if the thought is you'll use the full shape to stitch around in one motion. Smaller circle sets might still be good for arcs though. Next I used the same half circle template to stitch continuous curves (CC) along the sides of these 2 inch squares. I could have used the smallest size of continuous curve ruler I have from Accents in Design for this too. This is a great design for areas with lots of squares. Finally, I did some curved crosshatching. I am loving curved crosshatching and did this sample with the 10 inch continuous curve ruler. I did a variation on the CCX too, which was a first for me. I an really enjoying the challenge of working on these designs with and for you. I know many of you now have rulers and ruler toes (or an alternative for your machine) so I hope to see some of your work too! Several folks have asked for which 2 rulers I would recommend if you could only get 2 and I'd say the 8 inch straight ruler and the 10 inch continuous curve ruler. I am so sorry to not have some ruler toe alternatives for some brands of machines. I'm a Janome girl and my experience is very limited with other machines. That being said, you can still use your free motion foot for ruler work with great care, and in the meantime, if none of my alternatives given in last weeks post work for you, contact your dealers and make sure they know that there's a demand for such a toe! Don't forget to bookmark this blog, follow, or sign it up in your favorite feed reader. Like the facebook page (I do post some short things on it pretty regularly), or even check out my Pinterest boards. I've even got a pin board for quilting with rulers. I'll be visiting you too! Finishing up the binding on my farm quilt. 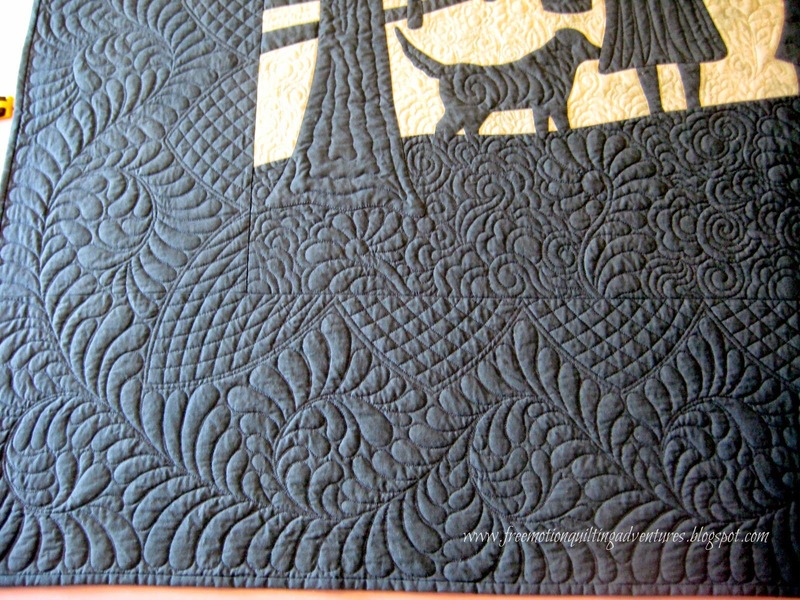 I love the free motion quilting on this one, especially the ruler work with the curved crosshatching. Actually turned out pretty darn close to my vision for this project. Netflix is a fabulous binding tool- put on a great movie, but not too great (nothing too distracting from stitching), and stitch until your bottom goes numb. Speaking of binding.... I nearly didn't have enough fabric left! These are the only scraps left from this project. I like using my take on Sharon Schamber's glue technique for mitered seams and binding. First I fold the strip and get it just right. Then I press the fold as I slide the ruler off. This next pic is at a funny angle, I swear the fold is at 45 degrees, it just doesn't look like it. Then I use a little watersoluble glue. Yes, glue. Shoot me, quilt police. Sometimes I just use Elmer's school glue, but this Roxanne's Glue-Baste-It had an awesome tip, so I'm using it and will either buy more, or re-fill it with the cheap stuff. Apply the next strip carefully lining it up, then press to set the glue in a hurry. Then I can repeat the process until all the strips are glued to make the length I need. Next, I sew down the fold line. I stitched the binding on with my walking foot, but I'll finish this binding by hand. Another night or two of Terra Nova on Netflix and it'll be done! Above is a shot of the back, though I don't think you can see a whole bunch of detail. Maybe I'll get more pics when it's completely done. But for now, it's definitely "Off the Wall" and I'm linking up with Nina Marie. It's past time for my Free Motion Monday Quilting Adventures post and while I'm posting it before it's officially Tuesday, it's not the post I had planned. This weekend and Monday has been a doozy. I talked a lot about the foot options for ruler work last week, so please read there if this is your first introduction to this technique. But Carol Olson and I had emailed a bit this past week (She's the owner of Accents in Design, maker of the Fine Line Rulers and Templates that I love so much) and she had some information that I thought I'd pass along for those who aren't Janome users.
" I did find a 1/4" ruler foot on ebay listed by NgoSew Sewing Parts Co. . This foot is made for Juki TL98, TL98E, TL98Q, TL98QE, TL2000Qi and TL2010Q. The price on their ebay store is $75.00. I looked at Viking/Husqvarna, I had a Husqvarna prior to my Janome and used it during many classes and show demonstrations using the rulers and templates. They have two Open Toe FMQ feet, one is "Floating" or stationary and the other one is hopping. The foot is not as high as the Janome or Juki, however, it is thicker than most. I used the stationary one and it worked well. The stationary one is part # 412801045, the hopping one is #412531045. Elna is exactly the same as Janome, so they would be able to use the conversion set as well. Bernina, since the newer machines (not 35 years+ like my old one) seem not able to use the conversion set with the adapters, I did look at three of their Embroidery FM feet. Foot #26 is a closed toe round foot and looks like a shallow bowl which would work with the rulers. Foot #24 is open toe for FM Embroidery or quilting. Foot #92 is a FM Embroidery foot, looks like a thick hook style, curved from left to right with the opening on the far right side. Using the rulers and templates on the left side, it should enable a clean swipe along the ruler edge." I shared with her my thoughts on one of the Bernina feet she had mentioned, the #26 foot does look like it would work except that it has a small teardrop shaped opening for the needle and I am concerned that with the sideways pressure of the ruler, the foot could shift and allow the needle to hit the foot. We are both married to handy fellas and were of similar thoughts that the foot could possibly be drilled out and carefully sanded to work well for ruler work on a Bernina. She also reiterated that ruler work can be done with regular free motion feet if done with care and usually with less speed. We also think that it's just a matter of time before some ruler toe type feet or even adapters hit the market for these other machines. I also tracked down Patsy Thompson's post on her improvised ruler work foot using the Babylock/ Brother Free Motion Foot C. She super glued a small 1/4 inch cylinder to the foot. So there are some options for those who have other brand machines. So now it's time for some designs. I did all of these on paper this time as I just didn't have enough time to stitch some up. Getting these weekly series posts done on time is a challenge for sure, but I am hoping to start getting a few posts ahead so I can get them done better. First a note about planning ruler designs: When you choose a design for your project, you've got to consider the size of template or ruler you have and how it will fit in the desired space. Remember that the stitched line will not be right along the edge of the ruler, but a quarter of an inch away if using the Janome foot, or some other distance using another foot. So the design needs to be spaced according to the stitched spacing, not the ruler spacing. If you draw it out (and I strongly suggest you do), make sure to rig up a spacer for your pencil so the spacing is accounted for. I have a small acrylic washer from Quilter's Rule that is the same diameter as my foot. Also, it is wise to add a few reference lines even if you think you can use the lines on the ruler to space your design. Some designs need additional markings to get the placement just right too. Don't skimp on the needed markings! You'd hate to complete a run of a design and find out that you're not perpendicular or parallel to your piecing lines when needed! I really hate marking, but it's not too bad to set a few markings to keep me straight. Today I am focusing for the most part on designs for borders and sashing. Borders are a great place to put ruler work. Borders can be dressed up with scallops or swags. Scallops and swags can have piano keys or bead board with them. Above, you can see my drawing spacer/washer with some sparkly paint to help me find the tiny thing. Below are a couple of straight line designs for borders using diagonal lines and the straight ruler. Sashing designs are fun with rulers too! Below are a traditional egg and dart pattern and a variation I have seen lately. The diamond looks really neat when at the corner of sashing. It works into a 4 point star-ish shape or a bigger diamond. And below is a tiny stipple and a e.l.e. loop (a bad one too! Eek!) in the diamonds. I've got to say I like that stipple! Though the better place to fill the design below would be the half diamonds along the side, leaving the whole diamond to 'pop'. Next week I'll show some designs for ruler work on piecing and filling in setting triangles and such. Hopefully there will be actual stitched samples and maybe a video or two. All of these designs above were done with Fine Line Rulers from www.accentsindesign.com They are the rulers with pegs for extra secure hand positioning and a great velcro hook tape on the underside to prevent the ruler from slipping. They also have good markings on the rulers, more on that in another week's post. Accents in Design has graciously provided me with several more of of their rulers to supplement the rulers I had previously bought and I can't wait to use them to show more ruler work designs next week. In addition, they are providing a set of the continuous curves rulers to one lucky participant of this month's series. So make sure to comment and/or link up to be entered in the giveaway! Make sure to leave an email addy if you are a no-reply blogger. Whew! That's a lot of material to cover in one post!I am sure there are questions, so ask them in the comments. Now, a word or two about this linky. In addition to my usual guidelines, I've got to mention that I want this linky to benefit all the bloggers and wonderful readers involved. So firstly, since my link series is about the series of designs I'm showcasing on my blog, let's make sure that's whats being discussed in your linked post. It can even be a previous month's design. There are other linkys out there that may welcome your link about some great product you are hawking (yep, had a few spammers to delete). There are also general quilting linky's out there to join. If your post is relevant, link it up here. Secondly, please be courteous enough to post a link back to me or I will remove you from my party (ie: delete the link from me to you). (I hate that this sounds so mean, I really hate confrontation.) It's my party and I'll cry delete if I want to need to if the blog that is using the link opportunity isn't respecting the guidelines of this linky. If you are just linking up to as many link parties as possible to promote your blog and to earn points with Google for having others link to your site, kudos to you, but keep it relevant and reciprocal. I feel strongly about this. In fact I stopped linking up to a pretty popular blog link party when the blog owner's guidelines changed to specify she wanted the linked posts to be about something learned from her site. 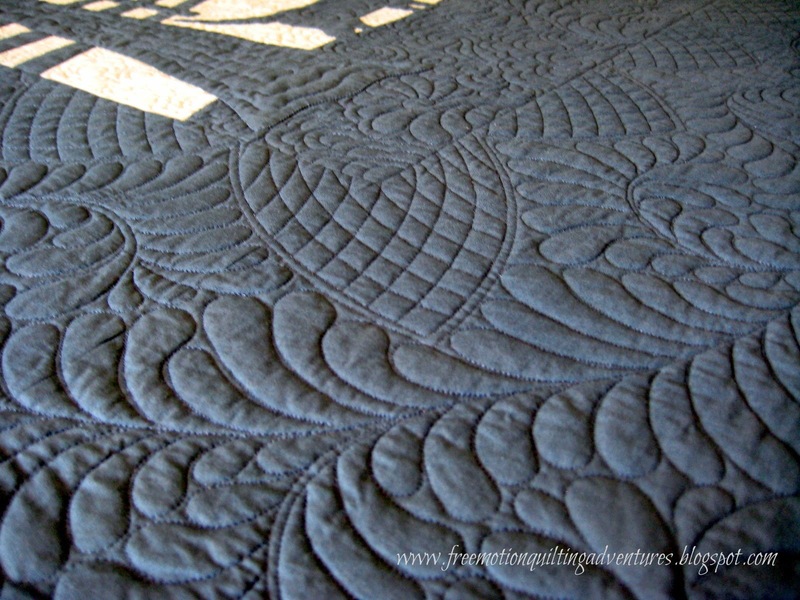 Since my posts usually were more about free motion quilting in general, I stopped linking to that specific linky. It would have benefited me to keep linking my posts and hope she didn't get offended, but I didn't meet her criteria, so I stopped until I have a relevant post. Now, if I've gone and made you mad, I'm sorry, but the guidelines for this linky are pretty clear. If I've made you worry that you've accidentally erred, email me at sonshinecottage[at]comcast[dot]net Let's keep it fun, civil, educational, and helpful for us all. Link back to this post somewhere in your post. You've got to dance with the one who took you to the party, so make sure you link back. Don't forget to bookmark this blog, follow, or sign it up in your favorite feed reader. Like the facebook page (I do post some short things on it pretty regularly), or even check out my Pinterest boards. I'll be visiting you too!